New Year’s Day was supposed to be a day of celebration. Since the fixtures were released back in July we had been looking forward at welcoming Maidstone United at The Dripping Pan today. With an expected four figure crowd, a special bumper edition matchday programme written and enough organic burgers to feed at least a dozen people we were ready to put on a show. On Saturday our pitch team battled against the elements to get our game versus East Thurrock United on and we all did a collective sigh of relief when the final whistle blew and over 650 fans applauded the efforts of those who had not only performed but had got the game on. Alas, the forecast for the days before the New Year was poor, and so it was. We put “Pitch Watch” in place via Twitter, with images of the ground posted regularly to give us all hope. Alas, the torrential rain on New Year’s Eve meant that the standing water on the pitch wasn’t to the referees liking and with a very heavy heart our game was cancelled. The cost to us? Thousands of pounds. Instead of welcoming a crowd of 1,200, we will be lucky to get 400 when the game is squeezed into a midweek slot in February. Gate receipts will be down by £8,000. Programme sales down. Catering down. Bar takings down. Yet our costs don’t change. Players still need to be paid this week, utilities have to be paid, printers still want their invoices paying. We weren’t alone. In fact every game in the Isthmian Premier fell by the wayside, and only one game in the Conference South made it to 3pm. But with a “free game pass” I had little options as to where to go. 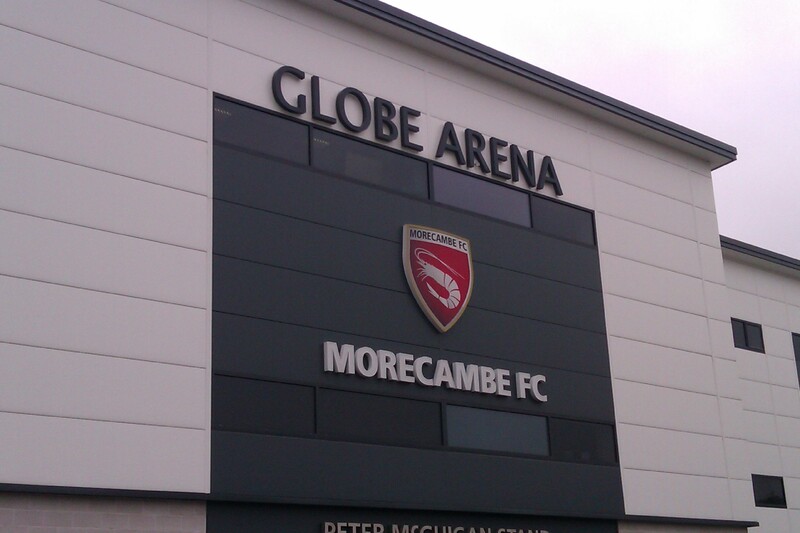 The Daggers Diary team take the long road up to Morecambe to see whether their promising start to the season could continue. Last weekend’s win over Bristol Rovers at Victoria Road was a first win in five league games for us. Granted, there had been three 1-1 draws in that run, but also a 3-0 defeat at Mansfield which was described as “not the best day out we’ve ever had” by those that attended. The defeat at the Conference champions was swiftly followed by a home tie in the JPT against Colchester. Going one down just before half time had us facing up to another early exit from a cup competition, but a second half recovery, aided by a much better performance and a red card for former Dagger Magnus Okuonghae produced four goals without reply to earn a second round trip to Southend United. 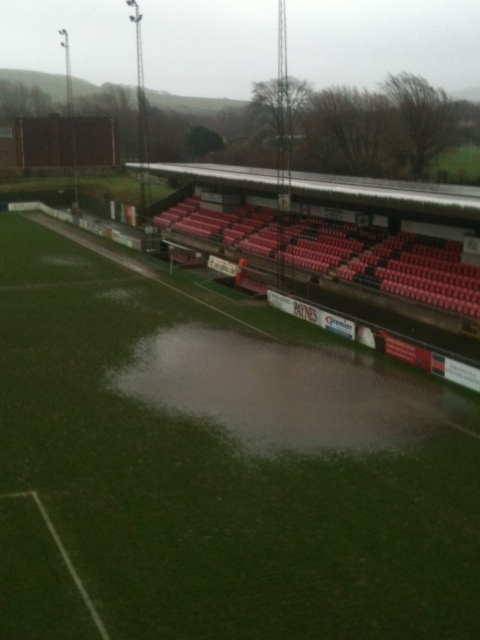 Exeter City then provided tougher opposition a few days later. While the performance was good, the wasting of so many chances when we were on top meant that we never capitalised on our one goal lead, and in the end, were grateful to hang on to a point, as the visitors scored their first away goal of the season, and threatened to follow it up with a second. It was a similar story last Saturday against Rovers. Once again, we scored first, and were playing quite well, but gradually it levelled out and soon we were under the cosh. When Brian Saah was penalised for handball inside the area, the feeling of deja-vu was the overriding emotion as the ball was placed on the spot. Matt Harold’s spot kick though was well saved by Chris Lewington, and despite a few more nervy moments, the game was settled by a second Daggers goal to produce that first win since York City visited in mid-August. “Fancy a match report?” Steve Wilson asked me at Dagenham Dan’s wedding recently. Thinking it would be from your run of the mill European game in Spain, Germany or Italy (nothing wrong with these mind) I of course agreed, but wondered where I could find a home for it. “Sure. 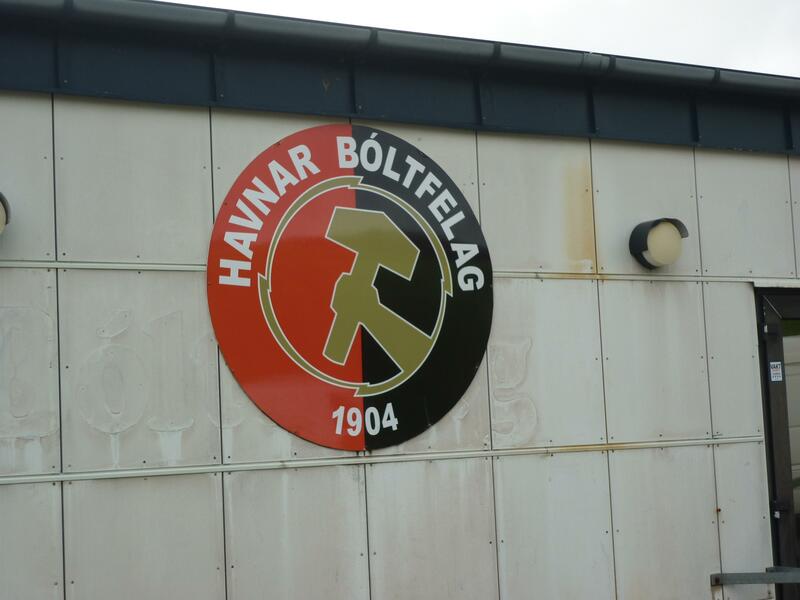 Where you off to?…”Oh, I am running a marathon in the Faroe Islands and there is THE big derby the next day”. Steve had me at Faroe Islands, as I am sure he would have in your case. The Faroe Islands have been traditional minnows ever since their admission into FIFA in 1988 and UEFA in 1990. Their results would back up this standing, having a record of P152 W18 D15 L119 of their officially recognised fixtures to date (including friendlies), a record not dissimilar to Lewes’s in recent years although I was mildly surprised they had won so many games. However, even the Faroes have had their moments in the headlines for the right reasons – their very first competitive fixture was a Euro 92 qualifier against Austria, which they won 1-0, to the surprise of everybody. Indeed, in the December 1992 FIFA World Rankings, the Faroe Islands peaked inside the top 100 for the only time, attaining a ranking of 94th. On a day when the rain didn’t stop falling, the storm clouds kept away from Dagenham & Redbridge for a couple of hours, reports the Dagenham Diary team. The Daggers had been reasonably active in the transfer market over the summer. Not on the scale of £90+ million for one player, but there had definitely been a reasonable turnover of the playing staff. Gone were the older, more experienced (but also some would argue, more injury prone) players, and in came some that we had heard of, but like always, bought in on a small budget. While we may have got some cash as a result of a sell on clause for Dwight Gayle’s transfer from Peterborough to Cystal Palace, all those who have been watching the club for any length of time weren’t expecting much to be spent on the team. Whitstable, home of England’s biggest village green (despite the fact it is a town), Alan Davies and TV’s worst comedian, Harry Hill. Twinned with Mölndal in Sweden and “just good friends” with Sisimuit in Greenland. And the final venue for my 2012/13 football season. Yes, you may say it is nearer to the start of next season than the end of the last, but I play by the official rules. UEFA told me over a coffee a few weeks ago (not all of UEFA but someone who works there) that the season ends on the 30th June each year, and so despite not seeing a game for over 4 weeks, today I bow out of the 2012/13 season having seen a grand total of 93 games. Not quite the high of 2011/12’s 105 games, but even still – pretty bloody impressive if you ask me (which of course you are). The final day of a league season brings a mix of emotions. There could be the heady excitement of promotion or even a league title, or a comfortable mid-table finish. There might be the chance to relax on the final day, having escaped from a tense season, or the disappointment of a season that hasn’t quite finished in the way that supporters would have liked. Dagger’s Diary’s Brian Parish tells us of the story at Victoria Road, where relegation back to the non leagues was very much on the agenda. Of course, you could be in our position, of going into the final day with the chance of being relegated. Last weekends defeat at Aldershot has prolonged the agony, and also meant that, combined with other results, that two teams will lose their league status on the final day. With nothing yet decided, the last week has not been great, and although work has been there to take the mind off of the impeding agony of the last day, the nerves have been slowing building. Simply put, Aldershot’s win, coupled with other results meant that, as we head towards 3pm on the last day of the campaign, there are still seven teams that could fill the two relegation places. While our visitors today, York City, are still in with a chance of going down (along with Torquay and Plymouth), it’s generally reckoned that any two from four will be the most likely to go. Every season one team in each division falls like a stone towards relegation in the last third of the season. Dagger’s Diary’s Brian Parish knows that feeling all too well at the moment as Dagenham and Redbridge slowly sink towards a life outside of the Football League. We’ve reached the last two weeks of the season, and unlike last year, when we produced a championship style run of form to save ourselves with two games left, this time season we enter the last couple of matches with our status for next season not yet confirmed. Last weekend’s game against Oxford was not good, but it did confirm that, if we need to try to provide the attacking impetus in a game (especially at home), then we tend to struggle. Whether that is down to a lack of experience, or just lack of ability, it’s hard to tell. Under the (presently interim) management of Wayne Burnett, the only two wins of his time in charge have both come away from home. While they have both been at teams chasing a play off spot (Rotherham United and Exeter City), the home form has produced just two points in the last two months. At least today, we are away. But it’s not going to be an easy one this. Tuesday’s night 0-2 defeat to Southend meant that Aldershot are six points away from safety with just two games to go. Defeat for Aldershot will mean relegation back to the Conference, five years after promotion with a points tally in three figures. A draw might be enough, although that would mean that they would need results to go their way in other games involving teams at the bottom of the table. A win, and they could go into their last game of the season with a chance of staying up.